Link Detox Smart, Automated and Ongoing, without the report starting. This new Link Detox® will run ongoing on all your websites - 1, 10, 100 or 1000 - automatically. Welcome to Link Detox Smart! Link Detox® Smart™ is the new platform we built from the ground up. And this sales letter is about our “Link Detox Smart Bundle” for you. Yes, and we now can connect the dots. In addition to very tough technical SEO and onsite issues, we now support internal links now also - for a select set of users, that could be first you. The price is a marketing experiment, so I limit this promotion to 30 accounts only. My special paid beta deal if you want. *We raffle away an account to a lucky winner, who's tweet with Hashtag #LinkDetoxSmart is found live on 29.3.19 at 19h19m. No legal recourse as usual. What is Link Detox Smart all about? Yes, we tried to replace me and my SEO workshops and consulting with this. Yes, To cut away all potential time-eaters in the link monitoring and link audit process that we could. Data gathering works fine and was automated for years. I’m talking about a hands-off interpretation of the data with easy to follow advice. An automated Offpage SEO advisory system, if you want to call it like that. So besides functional improvements, a lot more “bang for the buck”, due to a better utilization of your account, which means money and time saved for you. Why more bang for the buck? We’re the expensive ones at LRT I heard, aren’t we? No, I believe we’re the first and only leaders in Measurement of Link Risk and Evaluation of Links. And we just innovated again ahead of everyone. You can buy some “toxic signal markers” for “some links" elsewhere for cheap. Good luck with that. I could do a whole blog post on that alone, and probably will some day. But If you’re reading this, you are probably like many clients these days, they tried all the “built-in solutions” and Link Detox® knock-offs and want the real deal. Let's be frank, going for an all-in-one product is convenient. But what do you get from poor incomplete data and wrong recommendations? It's just like buying the cheapest chemo-coffee and wondering why you get a headache drinking it. I'm not for that, what about you? Don't settle for just some results that you found included in your random SEO tool. And if you have an agency, always questions their work and tools as well, of course. Who else do you know is also taking the target pages into account, hence look at the whole link, not just the source page?). just like the alpha testers that became beta and production users already. Yes, until we take it down. Maybe tomorrow? And you will get 70% off the original price - don't miss out on that. Well, the catch is this. You will get access to the new software platform for one year. And it's a new software platform after all, we ask for forgiveness and help to iron out glitches as we move forward. CAN purchase one of the limited accounts. So you will have to wait for the final go until everything is well prepared for you. So what is that bundle you're offering Christoph? which will be provided by the system. Would you like to get such advice for your websites? 1, 10, 100 or 1000? I bet. Don’t let this offer slip away. It won't get any cheaper than with this initial public beta offer. And spend even more time on the high level work, instead of gathering data points. Don't Miss the Chance for this HANDS OFF experience at an Unseen Low Price. Link Detox Smart will allow to run your projects on a much higher automation level than it was possible before. Christoph, how does the new app actually LOOK like? that existing users will recognize immediately. But you can also use the existing Link Detox Screener in bulk. What about all those new issues and patterns you will automatically generate? This is really the golden feature in the new "Smart Generation" of Link Detox and LinkResearchTools (LRT). Many years of experience baked into easy to understand advisory. This concept is something I planned for already for a long time, and I'm happy to roll this out now after many different approaches taken. I spend days and nights to think about and implement new rules on a regular basis with my team. Internal Links still will be rolled out on a one-by-one basis until end of June 2019. Look at publish dates and don't settle for crawl dates with "echo effects"
Do I hear your thoughts? Yes. I heard that, too. John said some months ago. And then they said the opposite, just some days later, how all unnatural links are of course YOUR responsibility - not Google's. When Link Detox and then Link Detox Boost were used. How some of the sites later disavowed more links holding them back and got beyond old traffic highs. John said on Twitter "You're responsible for your own site, regardless if it's random internet users dropping links and writing text, or random algorithms doing that." Google's John Mueller said in a webmaster hangout on Tuesday at the 16:44 mark that in some cases, disavowing or cleaning up bad links to your site may help Google's algorithm trust other links to your site. Let me quote what the question was and how John responded, plus you can watch it yourself below. If you want to put the risk of your website traffic into Google's hands, fine by me. But don’t say I didn't warn you! So if you want to leave it up to Google to figure it all out and let you stay in that dip, that's fine by me (but maybe not your boss). Note that recovery without Link Detox Boost can take up to 9 months. In this package you have 900 Boosted Links included. And those charts are enough testimonials I hope. If not, here are some more companies and users talking about us. This is the new product, the new automated nerve and energy saving way to keep track of your backlink profile. Experience from years of operating Link Detox and 1000s of recoveries baked into a whole New User Experience. You will receive a Link Crawl Budget of 1 Million backlinks to crawl per year. per month or whatever frequency is possible with the remaining link crawl budget. We will work with you to get disavow files, link lists, GSC connection of course before we start. You will be able to buy additional Link Crawl Budget per your needs without upgrading to another plan and use it at your discretion. Your account and data retention will be active exactly one year from account activation (earliest February 19, 2019, where we start roll out). (not 24 like the cheapest Link Detox Small Business plan so far that already costs € 249 per month). Automated suggestions on which problems we see and what to do. AUTOMATED and ONGOING. No more worrying about having to look for issues, or asking the wrong questions, our system will guide you. The ability to train the system on which actions to take for you. We still need you to decide, but it will learn from you. The ability to customize Link Issues and Alerts yourself and escalate them per your own experience and priorities. A super-fast, convenient and modern “single page app” to browse even larger amounts of data, with new reports, new functions in a completely redesigned user interface. You want to spot all new patterns of Negative SEO, that nobody spotted before, including us. Dangerous stuff. You want to spot new patterns of redirect problems, that nobody spotted before, including us. Nobody talks about those issues and they look SCARY sometimes. You want to get that competitive edge on your competition, and finally a HANDS-OFF solution for operating your website. e.g. 250.000 links in total (complete count) and you want to refresh that crawl every three months - 250k*4 = 1M links to crawl in in a year, and then some. Other combinations are possible of course, as well – you decide. then remember - that time will be over – if you have Link Crawl Budget. Of course it's now totally up to you how you use the Link Crawl Budget. You can also run 100 projects for 10k links each (the minimum size) just once. Why is the domain-based plan limit warning a thing of the past? Well, we remove that domain-based plan limit. Altogether. Only the number of crawled links matter – no artificial limiting of the plans by domain size. That just sucked, let’s be honest. Most of our clients have a mix of domains, and we didn’t support that well. Like I said in my video. In the future, by simply purchasing additional Link Crawl Budget you will be able to run more and larger domains. Or your existing ones more often. Did you see my video about the Link Crawl Budget vs. Credits? There’s not a limit on the number of domains in the future either. 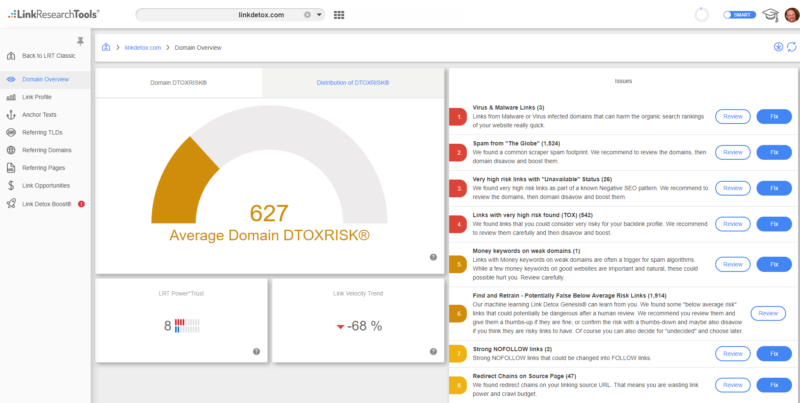 With the new Link Detox Smart plan, you will be able to run analyses on any number of domains and any size of domains in the future. You will even be able to configure all those frequencies yourself, as I show in that video here. Which Link Crawl Budget do I need for a whole year? If that says 150k or less, then this offer is a perfect match in heaven for a whole year. If the backlink profile size shown is below 1M you can still go ahead and proceed. If it’s above, you’ll need more Link Crawl Budget, which you can buy via an add-on later as well. If you need help with this, just let us know your domain, and my team and I will help you. Need more Link Crawl Budget? If, however, in the future you will need more link crawl budget, you can just top it up as you go. and we’ll add that to your account – no problem. With this deal you can initiate a DIY Refund for 10 Days all by Yourself – with one click. You just need to click a refund link. No problem. Once we set up everything for you however, no refunds can be given as per our regular terms (we already did the crawling work then, which is the cost driver). We created a special inbox for me and only for this bundle offer and all the users of the new product. That means I will personally look after every question you may have for this offer. We also started a new LRT Facebook group for user to user peer support where new users and old veterans alike work close together and my team and myself are there daily answering all questions interesting for the whole crowd. They are very happy with it. However, as you can probably guess, the new product is not as mature as the “Classic” LRT that we’ve maintained since 2009. So if you’re allergic to glitches and don’t want to help make this awesome new product even better, then better not sign up. YET. Do you have monthly plans? Can I pay by wire? Only annual plans for this unique offer. We also only support credit card or PayPal at this time for this offer. It's just 24 hours after all. Ready to take this offer? What’s the Personal On-boarding Webinar? Right after purchase we will prepare your account and let you access it ASAP. Then a week or two in we'll schedule a webinar that you can join to ask me anything about the product or SEO. We often do actual SEO work, link audits in those webinars, so joining is definitely recommended also if you have been to one before. Each of the webinars is planned for up to 60 minutes. When purchasing this deal you will get access to these products from the LRT Academy. Yes, you get all of the above included in this bundle! This pays for itself already. Please note - some of the training material will have screenshots from Classic LRT, but we'll update that over the next months and you will receive updates to all the training products at no additional cost. Did you make a decision by now? What are you waiting for? It doesn't get better than this. And this offer won't come back. Ok Chris, I get it - it won't get any better. I better BUY NOW before it is gone.